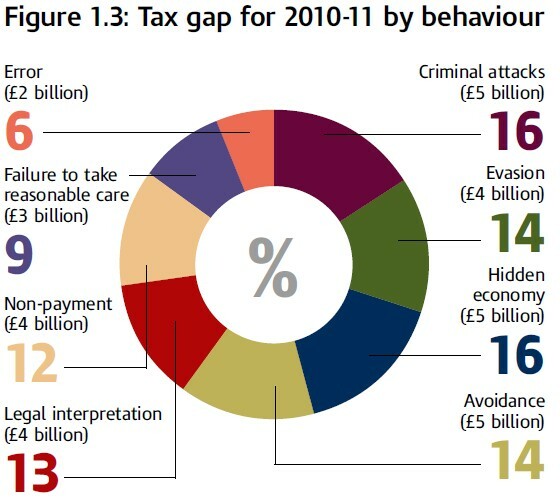 In the last stop on my whistle stop tour of the tax gap, I address how much of the tax gap is made up of tax avoidance. HMRC describes ‘avoidance’ (for the above purposes) as that which is ‘operating within the letter but not the spirit of the law’. As such, HMRC say, it does not extend to “legitimate tax planning” which “involves using tax reliefs for the purpose for which they were intended. For example, claiming tax relief on capital investment, saving in a tax-exempt ISA or saving for retirement by making contributions to a pension scheme”. Two cautionary notes must be sounded in considering these figures. First, some commentators appear to eschew the notion of “legitimate tax planning”. Richard Murphy, for example, the controversial tax campaigner, appears to regard even pro-purposive tax planning as the mere exploitation of “loopholes”. Second, as I have previously noted, the tax gap only refers to tax which is within the letter or spirit of the existing legislation. It does not refer to tax which should be within the letter or spirit of existing legislation. If pro-purposive tax planning is included, or the gap is defined as including that which should be taxed, then the size of the tax gap will increase and the proportion of that gap attributable to avoidance will increase substantially. However, as things stand, the proportion of the tax gap attributable to avoidance, whilst large in absolute terms, is relatively small expressed as a percentage of the tax gap. Despite this, it almost entirely dominates the political debate. I will turn next week to look at the Progress Tackle Tax Avoidance Charter. But, and this has been the point of my quick survey of the tax gap, an efficacious tax policy is one that goes everywhere the tax is uncollected, and does not merely follow the noise. In my blog of yesterday, I noted that tax advisers sometimes “police the line between avoidance and evasion”. When doing this, advisers are not paid out of common funds but by those who activities they police. If this reminds you of the activities of bond ratings agencies of yore, it should. And if you’re wondering whether you should feel comfortable with this state of affairs, you’re right to wonder. Let’s take a hypothetical. I’ve simplified things a little – but not so that it matters. X is in the business of developing tax efficient structures to sell to investors. And X has got an idea which it thinks will fly. Let’s call it the Big Idea – and assume that the effect of the Big Idea is to reduce X’s taxable income. And it wants to take it to market: i.e. sell it to corporates or individuals whose particular circumstances match what the Big Idea requires. And let me just say, for those who haven’t read yesterday’s post, there’s not, necessarily, anything wrong with the Big Idea, either legally or morally. Before anyone will buy X’s Big Idea – before X’s clients will pay for that idea – they will want to see that the idea has been ‘blessed’ by someone external to X. Someone who has both the expertise to advice on it and a sufficient reputation that their blessing carries weight. That someone external is not always a barrister, but let’s assume it is. The barrister will receive details of the Big Idea from X and be asked (and paid) to advise whether it works. If the barrister advises that the Big Idea does work, X can go out and sell the Big Idea to its clients. When a client then utilises the Big Idea they fill in the tax return with their (lower) income numbers that flow from implementing the Big Idea. Now, one of three things can happen: first, the tax return might not get checked; second, the tax return might get checked and HMRC might agree that the Big Idea works; third, the tax return might get checked and HMRC might decide that the Big Idea doesn’t work (and the courts might agree). What about the first possibility? You have to remember, when you file your tax return and pay your tax you’re paying the tax you think – or your advisers have told you – you are liable to pay. Not what tax you are actually liable to pay. And if you’ve participated in the Big Idea you’re going to be telling HMRC that you have less income than you would otherwise have and you’re therefore going to be paying less tax. Now, not everyone’s return gets checked. And if your return doesn’t get checked, it doesn’t matter whether the Big Idea works or not, because, either way, you’ve paid less tax. What about the second possibility? As as I’ve argued previously, some tax avoidance is good tax avoidance. We should be pleased when HMRC agree that it works. Some tax avoidance is bad tax avoidance and we should be displeased when HMRC agree that it works. But that’s for another day. What about the third possibility? I don’t, just for the moment, want to get diverted by a description of the process whereby a court might ultimately find that the Big Idea is also a Bad Idea. Let’s just assume that it has. The effect will be that you have made your return showing income of, say, 70, when, in fact, your income is, say, 170. So you will have participated in a tax avoidance transaction and you will have under-declared your income. But you still won’t be guilty of tax evasion – you still won’t go to prison – because, in filling in your tax return, you won’t have deliberately under-declared your income. You will have relied on the advice given by the barrister. That’s what I mean when I say that tax advisers sometimes police the line between avoidance and evasion. But perhaps the more important question is, do they invariably police it well? The amounts of tax at stake are vast – sometimes running into billions for a single Big Idea. And the fees that can be generated for X are similarly vast. And if, as a barrister, you are prepared to ‘bless’ a Big Idea you’ll make a great friend of X – who will be very pleased to come back to you again and again for (well paid) advice. And X’s industry also knows the names of the Boys Who Can’t Say No – which in turn can drive further advisory work to your door. So there are ‘powerful forces’ – to put the matter politely – operating in favour of saying ‘yes’. There are also powerful internal and external controls on saying ‘yes’: not least, your reputation and the inclination of insurers to indemnify you against the consequences of giving poor advice. I think most barristers at the tax bar get the balance right. But several do not. This aspect of the tax industry has, rightly, exercised Margaret Hodge (although you should not rely on as accurate the particular individuals she has named as offenders under cover of parliamentary privilege). But, more importantly, the account given above should spark further ideas as to how one might tackle tax avoidance. In a quiet, but effective, and pro-growth sort of way. I’ll come on to those another day. But let’s start with the first. And begin by clearing away some of the undergrowth. You can very easily distinguish between tax avoidance and tax evasion. The first is commonly (and accurately) said to be “legal” and the second “illegal”. But what is meant by these terms is less well understood. Tax evasion is, effectively, where you lie on your tax return. So you put the wrong figure in the income box, or you fail to declare income which you know you have, or you over-declare expenses or suchlike. It’s illegal and you go to prison (assuming you get caught). Of course, most larger taxpayers – individuals or corporates – need professional advisers to determine what figures to include in the income and expenditure boxes on their tax returns. I’ll need to come back and deal with the fraught role of advisers in providing that assistance: a role which, sometimes, can be described as policing the line between avoidance and evasion. But that’s for another post. So tax evasion out of the way, what about tax avoidance. Tax avoidance involves none of this. You declare accurately on your tax return the income and expenses that you have. But you arrange your affairs so that you pay less tax than you might otherwise pay. So if I choose to pay money from my earnings as a barrister into my pension scheme, I will not be taxed on those earnings: the tax code encourages me to make payments into my pension scheme by enabling me to do so out of untaxed income. So I will have arranged my affairs so that I pay less tax and will have avoided tax. Now, few people would regard this as objectionable. If the tax code offers me a reward for behaving in a certain way – because it serves some broader societal purpose such as encouraging people to save for their old age – and I behave in that way, why should I not enjoy the reward? Moreover, if you demonise those who seek out the tax advantages given to encourage socially useful activities – I have given the example of saving for my old age but one might equally think of funnelling seed capital to small enterprises or investing in research and development or giving to charity – or you financially counteract those tax advantages you diminish or destroy government’s ability to promote or realise those (valuable) activities or objectives. So tax avoidance is not a particularly useful concept and ‘stopping’ it is not a particularly sensible objective. Tax avoidance, too, needs to be subdivided. And here is where things get interesting. And complex. There is a difference between, if you like, ‘good’ tax avoidance and ‘bad’ tax avoidance. That which is pro-purposive – in other words, which runs with the spirit of the legislation granting the relief – is ‘good’ tax avoidance and that which “abuses” (to borrow a term from a recent statutory attempt to counteract tax avoidance) the legislation is bad. Most judges – and indeed HMRC – would agree that we should promote the former and discourage only the latter. But in order to identify whether tax avoidance is ‘good’ or ‘bad’ one is required to (a) formulatesome notion of what the legislation in question is trying to achieve and (b) whether the particular tax avoiding transaction offends against that objective. Although there are many instances of tax avoidance transactions where these exercises (or at least the second of them) is straightforward, there also many where they are not. I’ll return, in subsequent blog posts, to examine some consequences of these difficulties of categorisation. But, for the moment, I want to leave you with three thoughts. First, badging a transaction as tax avoidance does not, per se, tell you a great deal about the social desirability of that transaction. Second, demonising or counteracting all tax avoidance runs the risk of undermining important social objectives. Third, badging a transaction as ‘bad’ tax avoidance is by no means a straight-forward exercise.